I’m happy to report that my group had a safe return flight back to the states today. Three of our number stayed an extra day and are to fly back tomorrow. A great trip, lots of good memories; good folks to share the experience with. For tonight I’ll share a group photo that was made yesterday morning. This is along the Via Sacra. You can see the Arch of Titus in the distance. You can also see the beautiful weather I’ve referenced more than once during this trip. 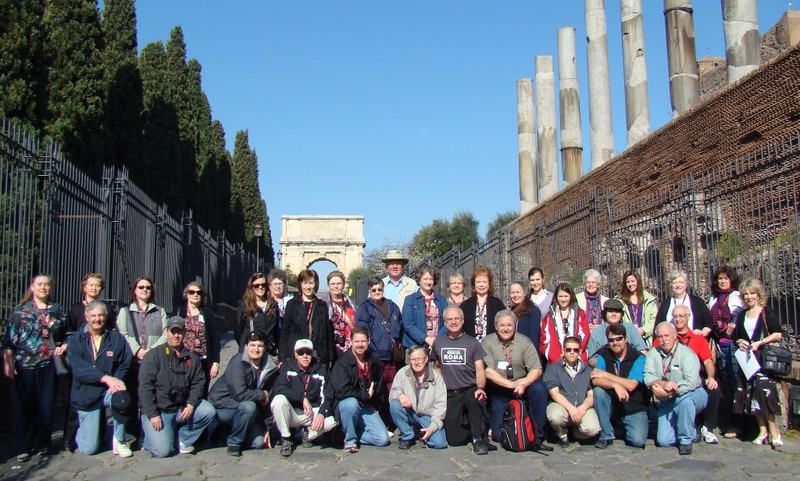 Group Shot in Rome, with Arch of Titus in Background. This entry was posted on Thursday, March 22nd, 2012 at 11:50 PM and is filed under Italy, Rome, Travel. You can follow any responses to this entry through the RSS 2.0 feed. You can leave a response, or trackback from your own site. Good to hear that you are safely home. It was a pleasure to follow you on your trip. Greet our friends & brothers in Belgium for Linda & me.